"Warm bananas covered in a rich sauce with a hint of nutmeg. This quick and easy dessert is a delightful treat any time of year! Ready to eat in just 20 minutes. This dish is best served the same day it is prepared. I typically use soft bananas and serve with ice cream." As good as the Lady says, I dont use the salt and sometimes replace the nutmeg with 60ml of dark rum at stage 2, but with or without the rum this recipe is excellent. 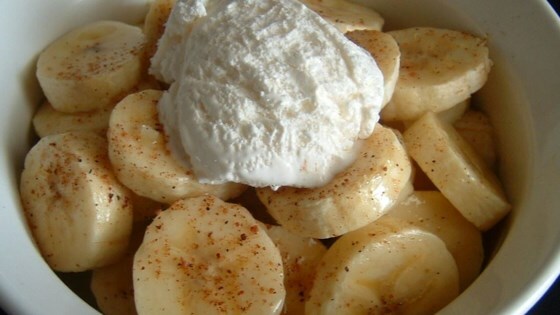 Wow - was looking for something to do with soft bananas and found this recipe - will make it again and again! These were really really good, but I thought they were lacking a little something. Chopped nuts? Drizzled chocolate? I added rum to the sauce, and that was an excellent plan! Yummy, great ice cream topping!